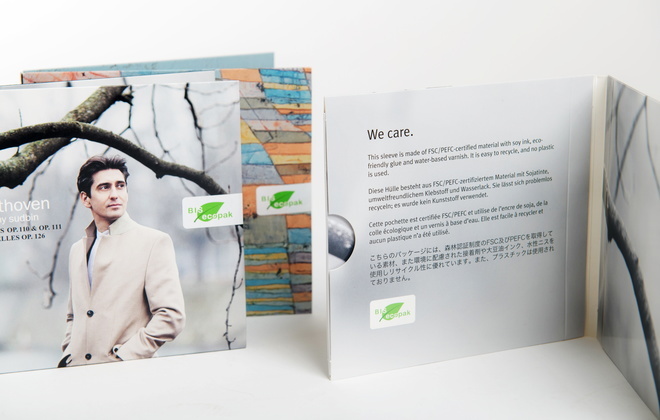 The BIS ecopak is a cardboard sleeve made of FSC/PEFC-certified material using soy ink, eco-friendly glue and water-based varnish. It is reminiscent of the classic vinyl gatefold sleeve and will replace the plastic jewel case as our standard packaging by summer 2019. The first two titles to come in ecopaks are a late-Beethoven piano recital with Yevgeny Sudbin and Nomaden by Joël Bons, a cross-cultural work awarded the prestigious 2018 Grawemeyer Award and featuring cellist Jean-Guihen Queyras and soloists from China, Japan, Central Asia, the Middle East and Europe. This is a small step but we hope that others will join. If you have green stories to share, we'd love to hear about them! Use the hashtags #BISecopak and #BeatsforthePlanet.